For anyone who lives in Melbourne, you'll know that Autumn has officially hit our city. Our evenings are getting darker earlier, and the idea of snuggling under a big blanket with a cup of tea is much more appealing than it was a month ago. 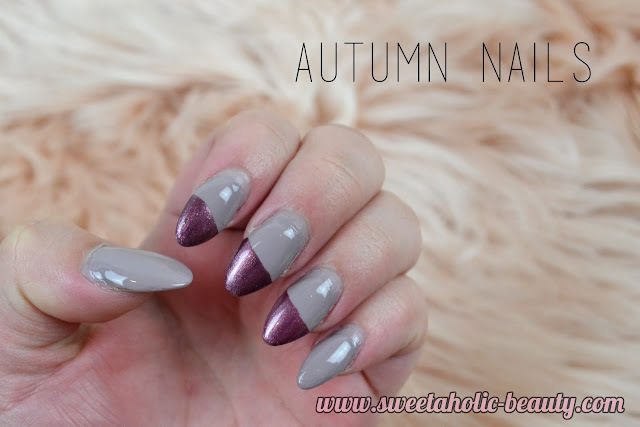 I haven't had a chance to do my nails in a while as my partner has been so unwell lately (so frustrating as he was doing really good up until a week ago) but I've found a few spare moments and came up with a simple and easy to recreate autumn manicure. I basically just painted my nails a nice neutral shade to start with. Since I don't have square or rounded nails, I was at a bit of a loss as to what to do next. I decided to try something a bit different and ended up with slanted tips on my three middle fingers. I thought it might look more interesting to just do a few fingers, rather than all of them. I used Liquid Palisade* to create the lines. They're not perfect, but this was my first time using this product and I think that practice will definitely make perfect. It was a lot of fun to play with, and I imagine I'll be able to do a lot of interesting designs with it. My tools of the trade. For the base shade, I used OPI Taupe-less Beach (one of my favourite shades ever). For the feature shade I used OPI Meet Me On The Star Ferry. I used Seche Vite as my top coat - as always - and as mentioned earlier, I used the Kiesque Liquid Palisade* to create the lines. Whilst it's not a traditional Autumn manicure with oxblood and deep blues, I thought it was a pretty and chic alternative. It's incredibly easy to recreate; if you don't have Liquid Palisade you can always use regular sticky tape. Have you created an Autumn manicure? If so, what shades did you choose? What do you think of my manicure? Ooh that colour combo! Gorgeous. No jokes, I have Meet Me On The Star Ferry on right now! Grey is a lovely colour on the nails. Can't wait to whip out autumn colours now.